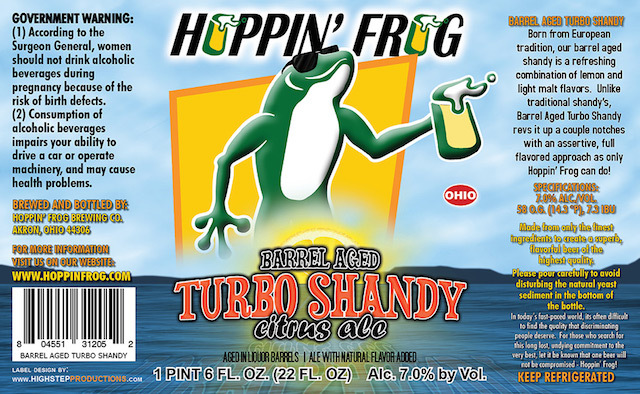 Hoppin’ Frog Bourbon Barrel-Aged Turbo Shandy Returns Tuesday! (Akron,OH) – LIMITED RELEASE: The whiskey sour-like flavor of Bourbon Barrel-Aged Turbo Shandy returns for a second time this Tuesday, February 16 in our tasting room at Hoppin’ Frog Brewery! This beer was aged in Bourbon whiskey barrels, and is a great flavor combination that we first unveiled exclusively in The Tasting Room last year. It was SOOOO good and so well-received that we decided to do it again, and improve it to make it even better – so, this should not be missed! Bourbon Barrel-Aged Shandy will be on tap through Winter, with a very limited release in bottles starting THIS TUESDAY – hope to see you here! !